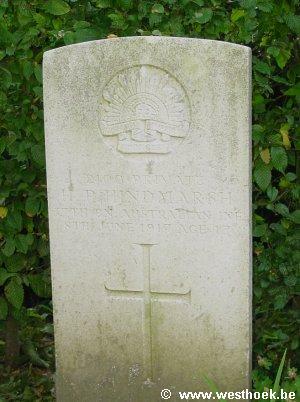 Private HECTOR PRETORIA HINDMARSH 2100 37th Bn., Australian Infantry, A.I.F who died on Friday 8 June 1917. Age 17. Private HECTOR PRETORIA HINDMARSH 2100 37th Bn., Australian Infantry, A.I.F who died on Friday 8 June 1917. Age 17. Son of Thomas and Elizabeth Hindmarsh. Native of Adelaide, South Australia. STRAND MILITARY CEMETERY Grave V. A. 12.